2nd April 2019: Coca-Cola Great Britain has revealed that the Official Coca-Cola Premier League Trophy Tour will be coming to Cardiff, St David’s Shopping Centre this Saturday April 6th, 10-6pm, as part of its nationwide tour giving fans the opportunity to have their photograph taken with the Premier League trophy and enjoy some unique football experiences. The Premier League trophy – Before the Premier League trophy finds a home come May, fans will have the chance to experience what it might be like to win English football’s best prize and have their photo taken with the Premier League trophy. ‘Battle of the Ballers’ Fans will have the chance to put their virtual football skills to the test with FIFA games running through the day and a FIFA competition hosted between 3-5pm in each city. 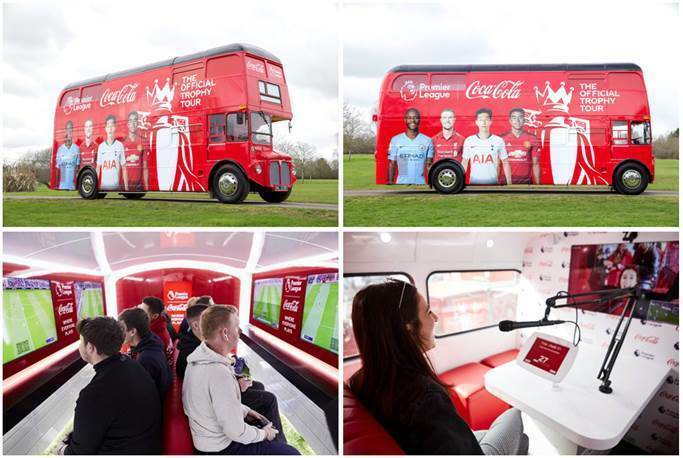 8 fans will take each other on to be crowned champion and take home tickets to Premier League matches and the ultimate ‘gameday at home’ package, including a Smart TV to watch all the Premier League action at home. •‘Take the Mic’ – For those who think they can do better than the pundits, there’s an opportunity to put those commentary skills to the test against a memorable Premier League moment to be in with a chance of winning the ultimate behind-the-scenes Premier League media day experience. Meet & Greet with Cardiff legend Danny Gabbidon who will be taking to the stage for a guest appearance and Q&A session.